” Cross Posting To Save Animals Lives Adverts contribute towards site running costs, but currently may not fit with the site ethos. We will continue to work on a solution. What happens once an animal is offered a rescue space? How Does Crossposting Save Lives? Where do I Find Animals Posts To Crosspost? Where Do I Crosspost Them To? Pounds For Poundies is an organisation that pound helpers, or pound pullers, go to to help them find rescue spaces for abandoned animals in local authority pounds and shelters before they are put to sleep. Pounds for poundies, and other similar groups on social media sites, depend on people cross posting the posts. Cross posting, or sharing the posts, mean more people see them, which coud hopefully lead to an animal rescue offering the animal a rescue space. It is important to share from the original post, and not just the post you see. To get to the original post from the one you see, all you need to do is click on the picture. Once I have shared the post (cross posted it) to my Facebook page, you can see below what it looks like. If you choose the “Share…” option on the menu that appears once you click the “share” icon on the post, you can write information to let people know what is important about the post you are sharing. You can see what I wrote at the top of the post. Not all posts appealing for animal rescue spaces look like the examples above. There are many set out in different ways and using different language. For instance, to indicate when the pet entered the pound, some posts say “In:” and then state a date, and to indicate when the pets time is up, or when it needs out of the pound/shelter by to save its life, some posts say “Out:” and then state a date. Different information is used on different posts too, depending on who wrote them and what information the pound pullers have about the pet. It is always vital to have on the posts who to contact with an offer of a rescue space for the pet, and how. Sometimes all the information about the pet is on the post, which you can see by clicking “see more” at the bottom of the Facebook post (if it gives the option). Other times, to get more information, you may have to click on a link on the post to be taken to a website page. Rescue back up is when an official animal rescue backs up a fosterer in that they pay essential veterinary & food fees for the foster pet, and the pet will be re-homed through the rescue. Also, if anything goes wrong and the fosterer cannot continue fostering the pet (for instance, if the foster pet and the fosterers existing pet badly fight, or the fosterer goes into hospital), the rescue will take responsibility for the pet. The term RBU is often used in the context of “Can go to rescue or fosterer with RBU”, or if they have the possibility of a fosterer, but one who needs rescue back up (as all fosterers do), they may say something like “Rescue Space or RBU Needed”. This is when the animal is put in boarding kennels at a cost, to give it more time to find a rescue space. A home check is where the prospective adopter is visited in their home and to check they are a responsible person who will keep the pet safe and well care for its whole life. Fosterers also need to be home checked. This refers to what will happen to the pet if a rescue space is not found in time. The phrases “Euthanised” is often used and “Destroyed” and “Put down” can also be used. This is the best news to see on a post! It means that a rescue space has been secured for the animal and the post no longer needs to be shared. However, there will be plenty others that do! Other words or phrases are often used to mean the same thing, such as “Placed”, “Rescue space secured”, or similar. You may see on a post that pledges are needed, or that pledges have been made. 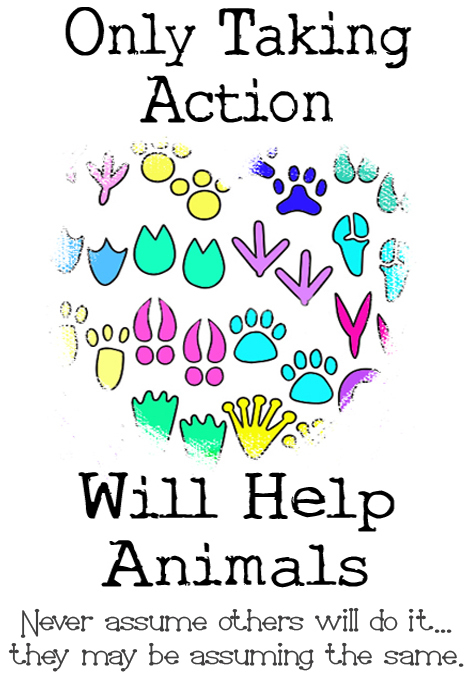 Making a pledge to an animal needing a rescue space means making a promise to donate later to help with that animals rescue costs. Pledges or donations give an animals a better chance of being offered a rescue space by a rescue. Some posts asked for pledges or donations to be paid immediately, as sometimes people who have made pledges sadly do not keep their promise. Local authority pounds and shelters do not usually assesss the animals and rehome them. “Rescue Only”, or “Rescue Space Only” means they will not re-home to the public. They will only allow an animal rescue with a rescue space to take the pet, who assesses it and re-homes it. 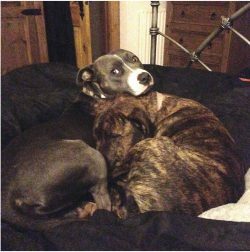 Once a pet has been offered a rescue space, their post (and website page if they had one) appealing for a rescue space will be updated. It will often say SAFE, or RESCUE SPACE SECURED, PLACED, or something to that effect. Those posts no longer need cross posted (shared). However, sometimes a rescue space can fall through, and the pet will again need its post shared. If you look in the comments of the post, you can often find updates about what is happening before the post an website is edited and updated. 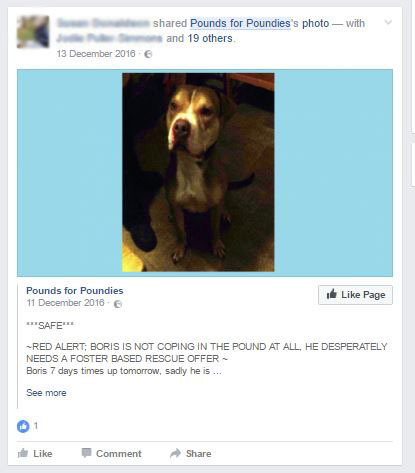 The comments can sometimes be confusing about whether the animal still needs a rescue space or not, but if the actual post (as opposed to the comments) says it does, then it is worth sharing/crossposting. Once the rescue place is secured, the animal can be removed from the pound or shelter. Volunteer transporters are needed transport the pet to its rescue space. They are a vital part of the life saving animal rescue chain, as if the pet cannot get to its rescue space quickly, it will lose it. People fostering and adopting pets from animal rescues and shelters is also vital, as if people did not do that, no life saving rescue spaces would ever become available. To understand how all the different cogs in the animal rescue machine work together to save the lives of innocent animals, see the How Animal Rescue Works page. Pets are regularly put to death by local authority pounds and shelters to make room for more abandoned animals to come in. As the stream of these abandoned animals is constant, the deaths are constant. 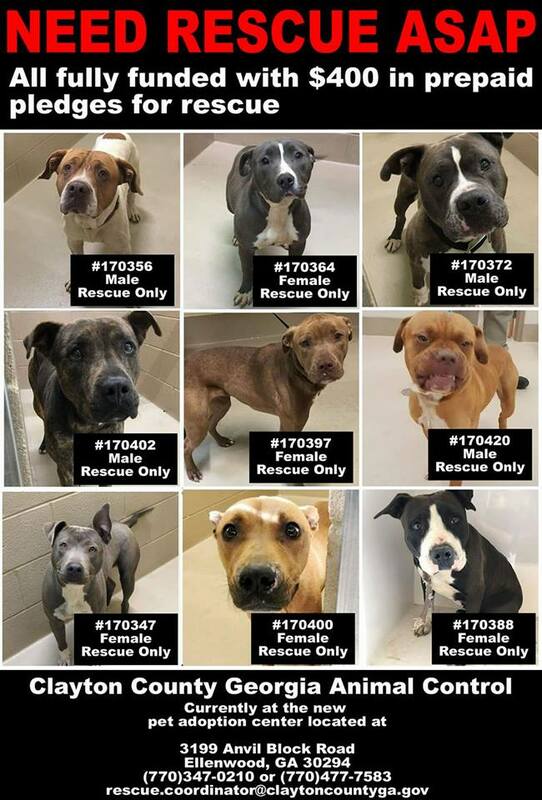 Animals on “death row” at local authority pounds and shelters need to get out before their time is up. They get 7 days in the UK and as little as 72 hours in the US. 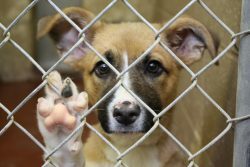 The only way the pets can get out of the local authority pound or shelter, other than being claimed by their owner, is if they are lucky enough to be offered a rescue space by an animal rescue. The only way animal rescues know that animals need rescue spaces is if pound pullers go into pounds, get their photos and details, and share them with animal rescues and on social media. 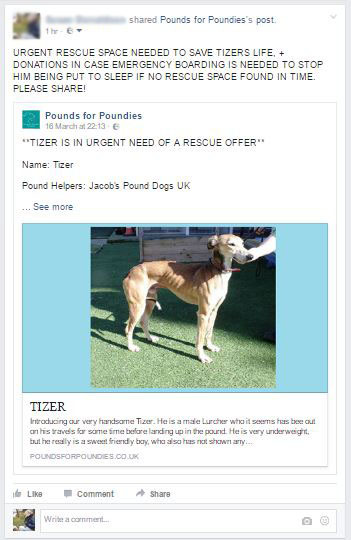 If no pound pullers go into your local authority pound or shelter, then it is likely that the lots of pets there regularly die with nobody ever knowing about them, or that they needed a rescue space to save their life. Some pounds and shelters do not allow pound pullers access, as it can bring them unwanted attention. For instance, sometimes people who see the posts on social media contact the pound or shelter, giving them abuse about killing animals. This often causes the pound or shelter to stop giving any access to pound pullers, resulting in more animal deaths. To avoid this, many pound pullers keep the identity of the pound or shelter they have access to a secret. 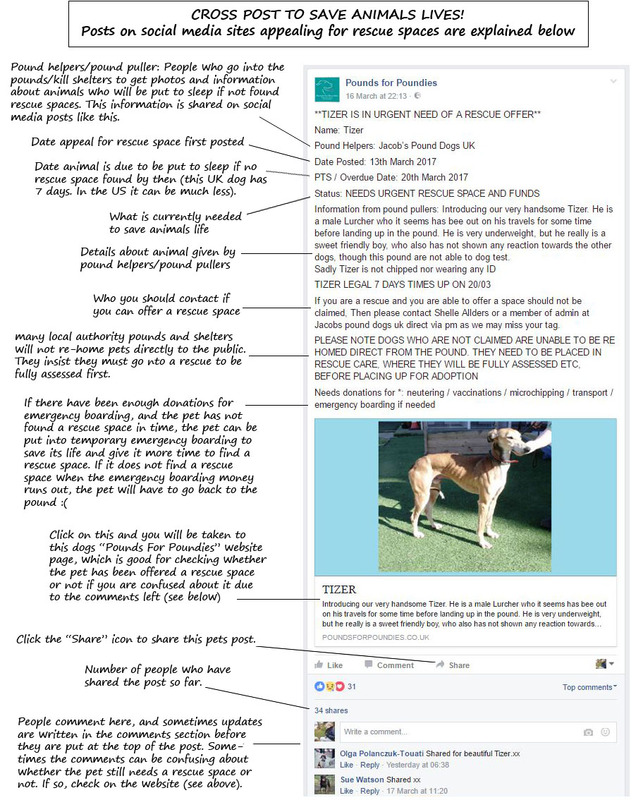 Local authority pound and shelter animals depend on people cross-posting the details that the pound pullers gather. 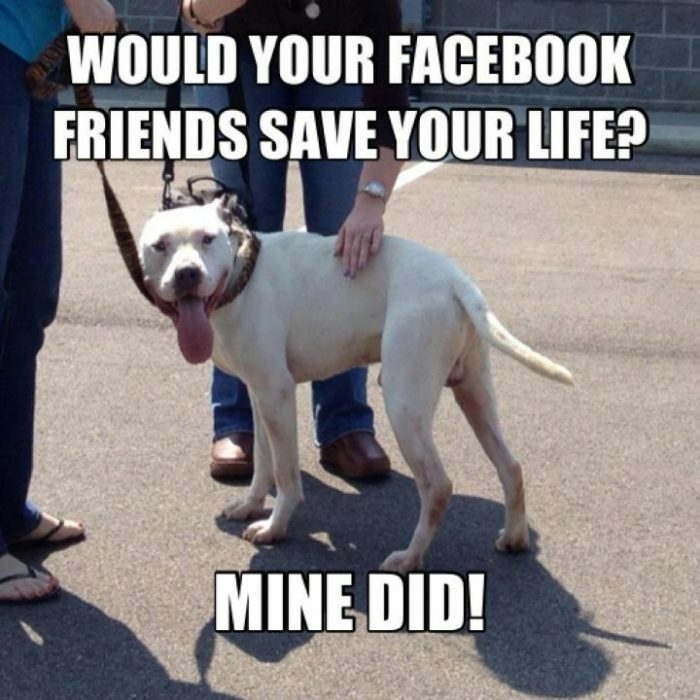 Animal cross posting on social media is done in the hope that someone connected to an animal rescue with a spare rescue place will see the post and the animals life will be saved. So many lives are saved this way! You will sometimes find there are not just cats and dogs that need cross posted. 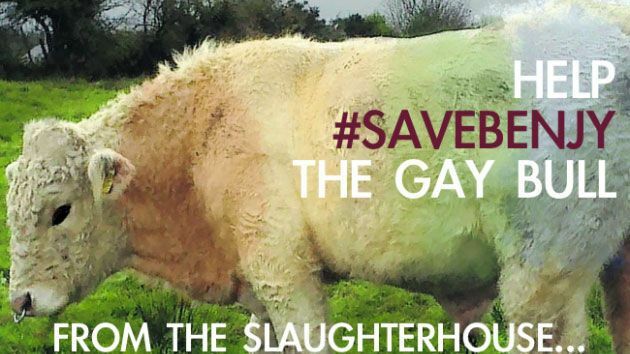 Other animals, such as horses and farm animals need rescued before they are sent to market and bought by the “meat man”, who sends them to be slaughtered. Social networking sites such as Facebook are a good place. 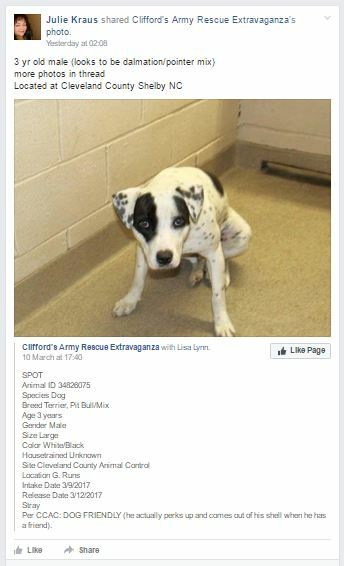 Search for Facebook groups containing words such as “Death Row Dogs”, “Dogs Rescue Spaces”, “At Risk Dogs”, “Crossposting”, “Cross posting”, Cross-posting”, “Rescue spaces needed”, and other variations. Also, try replacing the word Dogs in the phrases above with Cats, Pets and Animals. If you can think of any other words and phrases people may put in the names of such Facebook groups, try those too. You may have to request to join the groups once you find them. It helps your chances of being accepted into the groups if your own Facebook page shows your interest in helping animals in need. Those who run the groups often look at peoples pages to make sure people have a genuine interest in helping animals before they allow them into the group because they do not want spammers (who post irrelevant posts selling things) or trolls (who post messages designed to be highly offensive & upsetting to group members) in the groups. Crosspost, or share, them by posting them on your own Facebook page (timeline/profile), and also in any other pages and groups. This may be animal rescue or shelter pages or groups, or pages/groups where there are lots of people who have Facebook friends in the animal rescue community. To find such pages and groups, try entering phrases such as “animal rescue”, “animal shelter”, “rescue spaces”, “animal lover”, “pet rescue”, and any other you can think of that people involved in animal rescue might be involved in. You can also ask your friends if they will share your post, or if you can post it on their pages as well. Every share can be one step closer to that pet getting a life saving rescue space. Without the share that got the pet that rescue space, there’s a good chance the pet would have been put to sleep. Promoting adoption of rescue animals instead of buying puppies, and raising awareness of the issues of animal abandonment, and bad breeders will help. Do this any way you can, including using social media, word of mouth, and messages on clothing. Let them know there are general dog/cat/animal rescues, rescues for small dog breeds only and large dog breeds only, and rescues for specific dog or cat breeds that cover probably every breed. In Addition, there are many more ways to help animals in the Help Stop Animal Cruelty section of this site.